Winter is coming!! 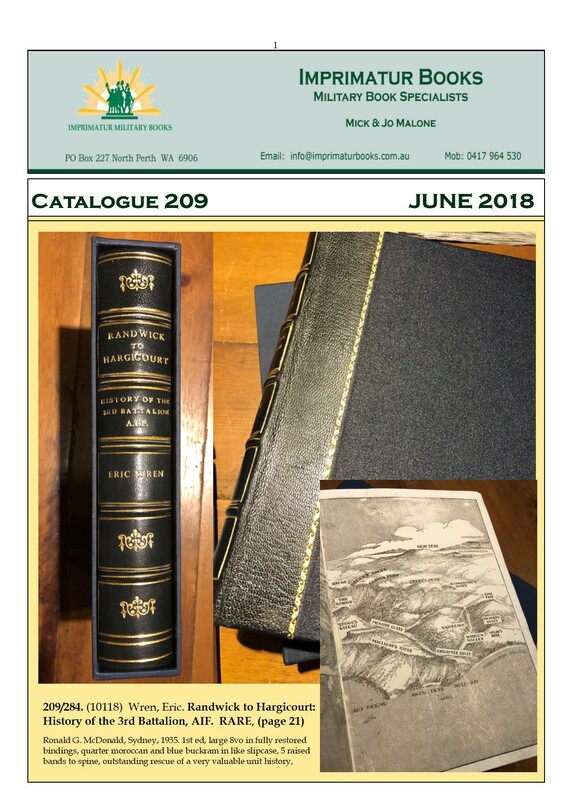 As Catalogue 209 hits the streets/airwaves we have a nice little cooling down here in Perth after a long hot summer. Heavy rain the other day was a welcome respite and does wonders for Hyde Park lake/s and Jo’s gardens. But we’re in for a dry winter. Poor old farmers, can’t take a trick. In WA, dry seeding is the best many can do. Remarkably, the crop yields still set nationwide records. The world of buying and selling books moves on it leaps and bounds. Cat 208 went very well with the Beans in their boxes selling as listed. Various other substantial items also sold which is heartening, the down-side being of course, it will be quite awhile before they darken my door again. Some unit histories of the 1st AIF were rare back in the 70’s and Blue Burridge came to the rescue by reprinting most of them. But the 1st editions do fetch the big bucks and can be significantly more expensive if they are signed/dedicated by the author and have provenance (ie, come from a famous General’s (ie Monash) library)). That’s the nature of rare books. The prices on some of these things continue to skyrocket. In this case it is unit histories, WW1, WW2 and Vietnam which fetch the big bucks. And I’ve got many of them, all in mint condition. Local military historians Neville Browning (WW1 unit histories), Wes Olson (naval and WW1) and Graham McKenzie–Smith (WW2 unit histories) are all still active and producing great work. These are people we all need to support. The accuracy in their research is first class and without them the work would not get done.